Weaving is distilled down into its most basic elements in this class. 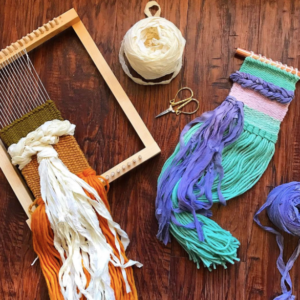 Children learn and find satisfaction in the tactile, repetitive nature of “over, under, over, under.” With a no-fuss portable loom and scraps of bright cloth and yarn, boys and girls can create wall hangings, rugs, hair ornaments, or other fun and colorful textile products. Students can learn and be inspired in this class accompanied by the music of nature sounds. All materials included. Membership starts at $45 per year and offers 10% discount on art instruction* as well as 10% off select Store items at the Gallery. *Does not apply to summer camps. Teacher, Shauna Lange, is a frequent writer and contributor to industry and academic journals focused on the intersections of art & theology. This work looks for pathways to merge art and sacred spaces, sacred places, and creative placemaking. Her writings and artwork have recently appeared in Christians in the Visual Arts; Faith and Form: The Interfaith Forum on Religion, Art, and Architecture; SEEN; Edge of Faith Magazine; and Boca Beacon. She has been featured in Roughhewn People; World Net Daily; Cloth Paper Scissors; and Somerset Studio Gallery. She is also a regular contributor to the American Institute of Architects Knowledge Community #InterfaithDesign and the International Architecture, Culture, and Spirituality Forum.